If you're trying to grow your YouTube channel, you'll have to come up with a few creative ideas to boost your engagement and grab viewers attention. Maybe you want subscribers or to use your YouTube channel as a funnel for leads. Luckily having a YouTube contest is one of the best to get both. In this article, I'll be showing you 10 YouTube contest ideas for massive engagement you can use each one no matter your niche or industry. Funny enough YouTube contest all started with a YouTube channel called “Renetto”, where someone experimented combining a Mentos with Coca Cola. This video hit over 9 million viewers and became the first ever trending video on YouTube. Renetto had no marketing budget, but still managed to get 9 million views without ads or promotion. If you're on a shoestring budget and need a fast way to gain views, followers and engagement try hosting YouTube challenge contest. With endless ideas like the Mannequin Challenge or Slime Challenge you can use a challenge based on a trending topic, or you can create one all on your own, preferably one that goes well with your brand’s image. BodyBuilding.com created a two 12-week transformation challenge and gave each of their winners $100,000 for the best video or picture transformation. The only requirement needed was that contestants had to use BodyBuilding fitness supplements and fitness programs. The term "Transformation Challenge" is a highly searched keyword on YouTube and social media, so BodyBuilding.com jumped on the phrase and has been using it on their YouTube channel ever since.. Try to avoid Tide Pod or Bird Box challenge mishaps. These challenges went viral and helped to grow sales and brand awareness but brought on a lot of backlash and lawsuits. So try to avoid challenges that may cause personal harm to your contestants in any way. These days with social media people are willing to try anything, even if it means swallowing soap or walking into walls blindfolded. The name says it all, you can create a contest where your subscribers or viewers can submit videos of their talents and feature the winner(s) video on your YouTube channel. Now to be fair, you have to have a bit of a following for this contest to work. Regardless you'd be surprised at how many people are willing to video themselves singing and dancing for a prize worthwhile. So try to get a prize that inspires people to enter. This is also a great way to show off your fans and subscribers. Use the videos submitted from your contest to inspire your next YouTube video. Your next video can be a creative “thank you” to your new subscribers and contestants. For example Liza Koshy made a view recapping all the videos submitted for her talent contest, even the videos that didn’t get the most votes. She went as far as trying the talents for herself just for fun. If you want to run this type of video contest, check out Wishpond video contest app that allows you to host a contest anywhere on the web, and have a live gallery of all the video entries people can vote on and share. Create a contest where you challenge your viewers to help you to reach a certain number of subscribers or Instagram followers and in return you would do an action or a video. If you’re going to try this type of contest avoid making clickbait video titles because it can do more damage than good leaving a bad impression on viewers especially if your trying to grow your channel. If an egg can beat Kylie Jenner on Instagram by simply asking people to like a post then imagine how much engagement and subscribers. Don’t make promises that you can’t keep.You have to make sure that whatever you promise to do for your new subscribers is something you’re willing to. Try to avoid saying things “we’ll giveaway a hundred free products” when you can’t afford to giveaway more than five products. This can cause a lot of backlash, legal discrepancies and bad brand awareness. Toy, Gadget and Product Reviews by Dad Did. A YouTube contest collaboration is done when two or more YouTubers come together to host a contest. This is a type of competition is powerful because you have two YouTube channels backing your contest which means more viewers, subscribers and reach. Two key things to consider if you think doing a YouTube contest collab would be to pick a YouTuber with the same or more subscribers/views than your channel as well as someone that compliments your brand. For instance a YouTuber with a fitness channel collaborating with another fitness influencer can help to build credibility rather than fuel competition. For example, YouTuber Keaira LaShae worked with The Fitness Marshall to give their viewers a free 7-day trial for her workout program. Anyone you plan to collaborate with has to get something in return, especially if the contest is centered around your brand or services. Just make sure that you come to an agreement that is mutually beneficial to both parties. Caption contests aren’t just limited to Instagram and Facebook. You can host a caption contest for an image or a video and give a prize for the best comment. Encouraging comments on your YouTube videos is one way of driving engagement for your videos, the more engaged your videos are, the more YouTube will see it as video persons might be interested in seeing. Comments are so crucial that Tubular Insights wrote a whole article dedicated to ways you can use YouTube comments to drive more engagement. ScreenJunkies did a 'Puncture' caption contest giving Chris Evans fans a chance to win a poster signed by Chris Evans himself! Place a word limit or prohibited words (i.e., profanity) if needed. Tell your contestants how the winning caption will be selected. Doing this can save a lot of miscommunication and a bomb rush of messages from sore losers. “Subscribe to Win” is one of the oldest ways to grow your YouTube channel. Ask your viewers to subscribe to your channel for a chance to win a prize of your choosing, then randomly select your winner. When Complex first started their YouTubechannel, they ran a "subscribe to win" contest that helped them to their reach goal of 1 million subscribers. Since then YouTubers have been using this method to grow their subscribers. Technically "subscribe to win" contests violate YouTubes official terms of service since these types of contests encourage the inflation of subscriber metrics. Proceed with caution if you plan on running one of these. You can ask your buyers to submit a video or comment about your product/services as a YouTube contest idea. If your business is on YouTube this type of contest helps to gain more subscribers and customers. 80% of YouTube users who watched a video to help them make a purchase decision and also said they watched a YouTube video at the beginning of the shopping process. You can use the contest videos to show off your fans and customers plus influencer persons who might be considering buying your product. UniWigs hosted a YouTube Product Review Contest that helped to increase brand awareness and subscribers successfully. Because each contestant had the option to do a video on any Uniwig product they liked, Uniwig featured the reviews for each of their products on their website. This helped visitors purchase products with the help of a real customers review on the page. 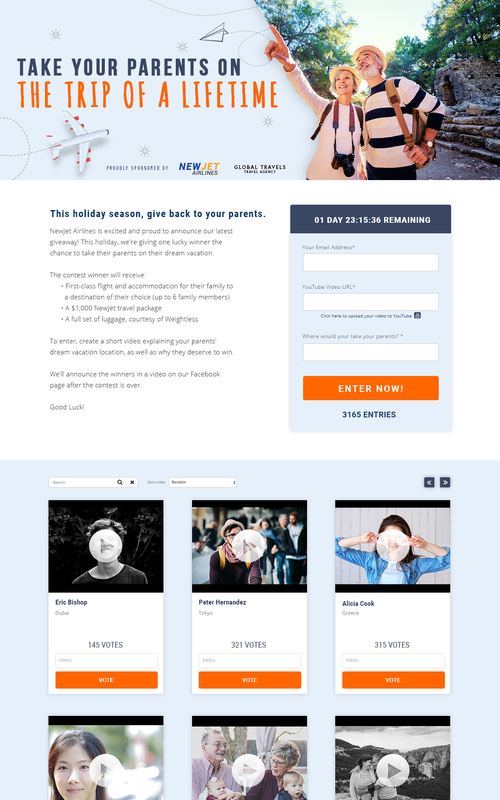 Consider using a third party platform like Wishpond to run a user submitted video contest. Using a platform will allow you to keep your entries organized, allow voting, and quickly export the entire list of participants with a list to their video at the end of the campaign. Giveaway contest is one of the easiest contests to host on any platform including YouTube because everyone loves winning free things. Most YouTubers use the 'Subscribe to Win" and Giveaway Contest to help boost the chances of getting more subscribers. Feel free to choose which entry method you like, there isn't a hard and fast rule to follow. It really depends on your contest goals. For example If one of your contest goals is to gain subscribers and emails, you can ask participants to subscribe and enter through your website or with a Wishpond social contest landing page. Why not host a contest about the next video you should put on your YouTube channel. You can ask your viewers to pitch a video idea and have it featured on your channel, giving credit to the winner of course. You can also throw in a prize or two to make it all the more exciting. If you're going to host this type of contest, you can ask contestants to comment on the video below and then filter through and allow the comments with the most likes to win. Doing this can take off the pressure of choosing the best comment and getting backlash from viewers, rather let the viewers choose the comments to make them feel more involved. You subscribe, like any follower on social media always want to feel involved or valued. Giving them the chance to be on your YouTube channel can help you to gain more subscribers. You should only try this contest if you have an active community of regardless of how many subscribers your channel has. Michelle Khare had a contest to celebrate reaching her goal of one million followers, where the winner would be featured on her new makeover show. Feel free to ask customers to upload videos about why they want to co-host with your or what your channel means to them. It's a great way to build SEO and brand awareness for your YouTube channel with little to no effort. The last thing you need is YouTube canceling your contest because you forgot to read the fine print. Before running your contest be sure to read YouTube’s Contest Policies and Guidelines. This also helps you to word your contest better to avoid mishaps or lawsuits in the future. Add Age or location restrictions if needed. Clearly, state the start and end dates of the contest. Place a limit or state how many times persons can enter. How and where will the winner be announced. If you need a hand coming up with contest rules, check out Wishpond's free contest rules generator. Try to promote your YouTube contest on all your social media platforms so that your followers are up to date with what's happening, it can also help you to get more entries and convert new followers into subscribers. You can use your website to promote your YouTube contest. Feel free to have a page on your website dedicated to it or use a website banner to grab visitors attention so they can enter to win. Another channel to promote your YouTube contest can be email marketing. Yes, email marketing is still alive. You can use Wishpond to automate and manage your email marketing so you can leave the heaving lifting and reminders to us. Now that you've gotten your YouTube contest off the ground, you need to monitor your contest to see if it’s doing well. Analyze your contest video performance by tracking subscriptions, channel views, and total upload views. It's important to keep track of your contest video metrics because it could be that your contest might not be getting the traction it deserves.So you might have to do follow up video or promote your video across all your channels even harder. You can use Google Analytics, Social Blade and YouTubeStudio to monitor and watch the traffic to your channel and contest video.
) that makes it easy to get the most out of social media and YouTube contests and built in analytics. After successfully hosting your YouTube contest it's crucial that you update your new subscribers and contestants about the results of your contest. Most YouTubers create a contest follow-up videos announcing the winner and thanking participants for entering because it shows that you value your subscriber base. Be sure to share and let followers on your other platforms know the results as well. After getting your new subscribers and boosting engagement on your channel the real work begins. You'll have to maintain your new subscribers by creating consistent content and encouraging comments and discussion. Which YouTube contest do you think you'd like to try? Have you ever hosted a YouTube contest? Let me know in the comments below, I'd love to know.